Speck's $50 PixelSkin HD Wrap for the third- and fourth-generation iPad is a hard shell case with an attached cover that rolls back and doubles as a stand. It certainly looks interesting, with a grid of tiny matte squares against an otherwise shiny cover. However, despite the slim design and seemingly intuitive functionality, there are problems with the case that you don't notice until you get some hands-on time. Like other offerings from Speck, the PixelSkin comes in a wide range of vibrant colors, including black if you prefer to keep things simple. The tiny squares diffuse the reflection from the otherwise shiny cover, but they didn't offer any noticeable extra grip to the case. There are a couple things that I didn't like about the case, so without further ado, let's dig in. The cover has a clasp to keep the PixelWrap closed, rather than the traditional magnets that keep the Apple Smart Cover in place. The clasp holds the cover down with a vengeance, which is both good and bad: It almost certainly won't come open on accident, but you may have to pry a bit to open the cover. I showed this to some of my colleagues, who didn't enjoy the firm grasp. 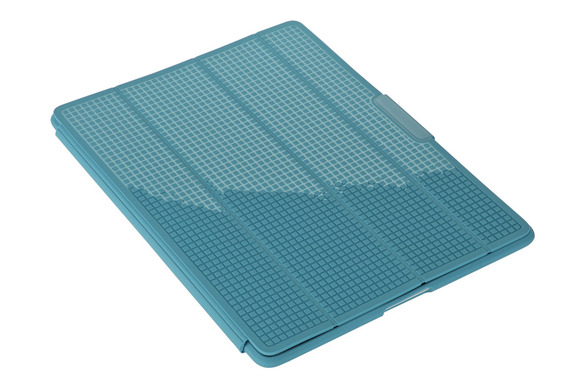 The PixelWrap encases your entire iPad front and back in flexible TPU, a type of polyurethane plastic. It has custom cutouts for all of the iPad's ports, as well as press through button overlays for the volume and Sleep/Wake buttons. The case also forms a raised bezel around the touchscreen in an effort to help protect it in the event of an accidental face-down drop. The hinge and cover are made of the same material, which I didn't appreciate. The hinge and segmented cover were far too springy, which made rolling the cover up to form an iPad prop more difficult than expected. Rolling the cover up really requires some effort. If you let go before it gets to its final shape, the cover will spring out of form almost immediately. If you're picking it up off a table, the cover will spring open and make a slapping sound as it hits the table, which I found annoying. I gave up trying to use the typing prop when not on a table, as on my lap the cover never retained the triangle shape of the prop. Propping the case up for what Speck calls an "improved landscape view" is a pain as well, since a special folding technique is required. Rather than use the same triangle shape as the keyboard prop, you start by laying the cover out flat. Then, using one hand to hold the cover in place, use your second hand to pick up the iPad and join the edge of the case with the clasp that holds the cover shut. (There aren't any directions included with the case, and it's kind of hard to explain. Luckily, Speck has a how-to video to help us out.) I can't see the improvement with this new landscape prop method, but maybe you can. The inside of the cover is segmented to help it fold better (it actually reminds me of a chocolate bar), yet there's no microfiber to help keep your screen free of smudges—it's just the same material the rest of the case is made of. Also found along the inside edge of the cover is the painfully obvious cutout for the cover's Sleep/Wake magnet. It isn't exactly pretty, but it works like it should. If you're looking for a case with a cover that won't ever open by accident, or enjoy the case's "new improved viewing stand," then the PixelSkin HD should be up for your consideration. However, I wouldn't advise you to purchase this case on a whim—see if you can try it out before you buy. It's functionality isn't for everyone. If you're looking for a case with a cover that won't ever open by accident then the PixelSkin HD should be up for your consideration. I wouldn't advise you to purchase this case on a whim—see if you can try it out before you buy. It's functionality isn't for everyone.